The opening hours of Kilsyth Swimming will be reduced by over a third due to financial cutbacks. The facility will continue to open seven days a week but staff will only work single shifts, resulting in hours falling from 90 hours a week to 59. Similar reductions will also be felt at John Smith Pool in Airdrie, Iain Nicolson Centre in Chryston and Keir Hardie Sports Centre in Holytown. The new hours for Kilsyth, to be introduced in November, will be Monday-Friday, 11am-8pm and 9.30am-4.30pm at weekends. North Lanarkshire Leisure claims it has no choice to ensure the pool stays open. A spokesperson said: “We are faced with unprecedented financial pressures due to the increasingly difficult marketplace in which we operate along with a reduction in our management fee. “As a result we have been forced to explore all options to ensure the future financial sustainability of the organisation. 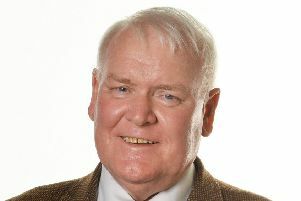 Council leader Jim Logue blamed cuts from the Scottish Government. He said: “This is a perfect example of the difficult decisions faced by this administration on a regular basis as a result of austerity from the Scottish Government. “A reduction in hours will allow us to sustain the facility for the community in face of the significant cuts to the council’s budget in recent years, with a further cut of £20 million forecast for next year. “As part of their proposed budget last year, the SNP proposed an even greater reduction in the management fee paid to NLL. Had their budget been passed, this pool would have been facing closure. Trade unions are being consulted to help ensure as many staff as possible can be redeployed elsewhere in the trust where necessary.